If you plan on spending your money on some clip in hair extensions you are probably wondering just how long do clip in hair extensions last. Clip in hair extensions are often much cheaper than extensions that are fused or bonded into your hair or even sewn into your hair. This is because they don’t take as much effort to put in as well as they don’t last as long as the other types of hair extensions. Even if you have real human hair clip in extensions you will still find that they may not last as long as the extensions that are actually bonded to your hair. This is because the clip can drag them down as well as cause damage to your scalp and head if you leave them in too long as well. Most clip in hair extensions that you can do yourself at home are actually synthetic hair, which when compared to real hair don’t last very long at all. In fact there are some cheap synthetic clip in hair extensions you can buy that only cost you a few dollars for your whole head but they may only last you one or maybe two wears. Depending on how you care for your extensions and how often you choose to wear them, clip in extensions can last up to 3-6 months. After this time you may notice that they don’t properly clip in or they are getting too frizzy or the hair is falling out. This is especially true when it comes to synthetic hair extensions as these last significantly less than 6 months. 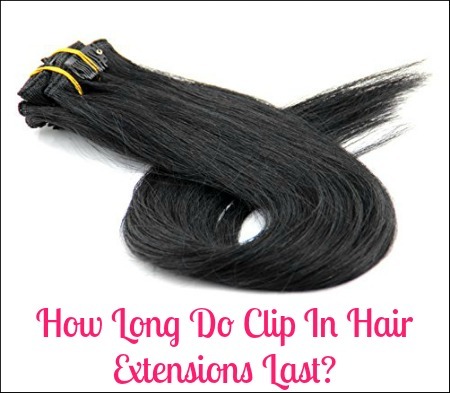 How Long Can You Leave Clip In Hair Extension In Your Hair? When it comes to clip in hair extensions it is recommended that you don’t wash the hair as this can easily ruin the extensions and make them unwearable after a very short period of time. This means that you should only leave your clip in hair extensions in your hair in between your washes.This may mean taking your extensions out every day or two to wash your hair and then putting them back in. Some stylist even recommend that you don’t sleep in your extensions if you want to keep them looking nice and not frizzy or ratty. As you sleep the hair can pull away from the clip or comb making them thin out a bit. Your hair can also become tangled up in the clip and you may wake up to a tangled mess that can’t be tamed without removing the extensions. Also, keep in mind that any type of heat source on the hair extensions can ruin the hair and it should never be used on synthetic hair extensions. If you want to keep your clip in hair extensions looking nice for months or even longer, I would recommend you take them out at night or at the very least in between your shampoos. Removing the clip in hair extensions every day also helps to promote healthy hair and prevent damage to your own hair as well. If you got your clip in hair extensions done professionally and you want to keep them in for a longer period of time I would definitely take caution and ask your hair stylist the best way to take care of them so they last longer. Usually clip in hair extensions are not meant to be worn for a long period of time but instead you should use fused or bonded hair extensions if you want to keep them in more than a few days. If you want your synthetic hair extensions to last, you are going to have to take good care of them. When compared to natural hair extensions, synthetic ones will take a bit more time and effort to care for. But when you take into consideration how much cheaper synthetic hair extensions are, you can still save a great deal buying synthetic extensions. The biggest worries about synthetic hair extensions is how much heat you can apply as well as the fact that they tend to get tangled much more than natural hair. If you are not careful you can easily melt your hair extensions or get them so tangled and knotty that all the hair pulls out of the clip area. Synthetic hair extensions are usually quite cheap, but that doesn’t mean you have to toss them after wearing them once or twice. There is a good way to take care of them and make them last much longer than a few wears. Whether you have bright purple hair extensions or more natural colored hair extensions, here is how you can take care of your synthetic hair extensions. Some people get scared to wash their hair extensions because it can ruin them if you are not careful. But sooner or later you will need to clean your hair extensions and the best way to do this is with a shampoo that is made specifically for synthetic hair extensions. I recommend DeMert Wig & Weave Shampoo for Natural and Synthetic Hair. This shampoo is gentle enough to be able to be used on synthetic hair and you can also use it on your natural hair extensions as well. The cleanser does a good job of cleaning the oil and dirt from the hair but it won’t strip the color. Unlike other shampoos you won’t have to worry about your hair extensions becoming a frizzy mess after washing or becoming so dull that they look a completely different color. The key to using this shampoo is it wash the hair extensions in cold water because synthetic hair can’t take the heat of a hot water shampoo. You can wash them in a large bowl of cold water with only a few drops of shampoo. Do not use a hair dryer to dry the extensions. They will need to air dry flat on a table. I also don’t recommend you use a towel to dry them either as that can cause them to become quite frizzy and unmanageable. Once your hair extensions are completely dry (remember do not use a hair dryer or any type of heat on them) use an oil free shine spray that is made specifically for wigs and hair extensions to prevent the hair from looking dull and dry. Bonfi Natural Oil Free Wig Shine is a great hair product to use that can be used on synthetic hair as well as real human hair to spruce it up some so it doesn’t look too dry and tangled. It basically gives the hair the shine you need without adding extra oil into it so that it looks more like real hair. It won’t leave a heavy greasy feel since it is oil free as you will find that other shine sprays will make the hair extensions worse rather then revive them. 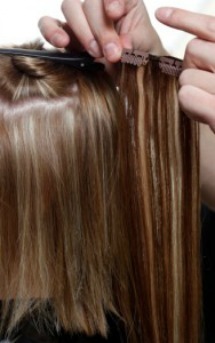 Be sure to only spray a little bit across the hair extension as you don’t want to use too much. This spray also helps with detangling the hair extensions as well since often times even real human hair extensions will get tangled after washing. This bottle of shine spray will last you quite some time and really is a great product to have on hand if you own any type of hair extensions, wigs or weaves. 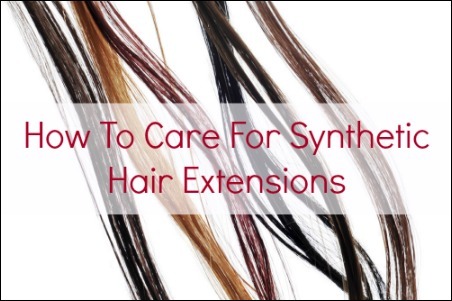 Probably the number one thing that you have to remember when taking care of synthetic hair extensions is to not expose them to any type of heat. This includes the temperature of the water you wash them as well as not using any type of hair dryer to dry them. Most synthetic hair will simply just melt any time they are exposed to heat, so you want to be careful about were you store your hair extensions as well. Lastly, make sure you are being gentle with the hair when you wash it as well as if you comb or brush the hair. The hair can easily be pulled out of the clip area if you are too rough with it. Also, you may find that the hair gets a lot more tangled if you are rough with it then if you are gently and use easy strokes to wash and comb the hair. Although synthetic hair extensions may never look “as real” as human hair extensions they still can be a great way to mix up the style of your hair and not have to spend a lot of money on them. In fact you can find synthetic hair extensions for a few dollars and they can easily transform your whole look. Just be sure to follow the tips in this article and you can enjoy your hair extensions for quite some time.